I use a large serrated Wusthof knife, similar to this one to slice bread. Since moving to a new site and using a new comment system, there have been some issues with importing comments from the old site. We’re working on it! How/what do you use to cut your bread? My slices are horribly uneven and either too thin or too think. I welcome any ideas…want to use my new USA bread pan and make some of your bread! I use a large serrated bread knife (like this one, although you certainly don’t need something quite that expensive)) on a large cutting board that doesn’t slip. You need to make sure that everything stays in one place while you are moving the knife through the bread (a trick to keeping the cutting board from moving is to place a damp tea towel underneath it). And watch the angle of your knife to make sure it is perpendicular to the cutting board. Too-thin slices are usually the result of an angled knife that keeps cutting back into the loaf instead of straight down onto the board. I just made your white bread recipe today and was wondering how to store it. Of course, I all my excitement when my 7-year-old and husband raved about it I sliced the whole loaf. So glad this story was on your blog. What timing! Going to order a breadbox tonight. Question, do you make multiple loafs at once? And, any recommendation for something to help slice the bread to the right size slice? Never double a yeast bread recipe. I suggest just making multiple loaves one after the other, and having them rise and then bake at the same time. I’m sure there are slicers out there – but I’ve never tried one! I will try doing that this weekend. My family loves it and one loaf a week won’t be enough. :) They say it’s better than Udi’s! this question doesn’t really belong here… but when a recipe calls for “whey powder,” are you talking about something like what is used in smoothies, etc.? the type of smoothie a person drinks after strenuous excercise? like… (whey) protein powder? Most of the whey powders you are referring to have lots of other additives, like sugar and flavoring. The brand of pure whey powder I buy is Niblack. I get it at Whole Foods and online. This may be a silly question, but do the principles apply for other breads like english muffins or hamburger buns? It’s not a silly question at all, Sarah. 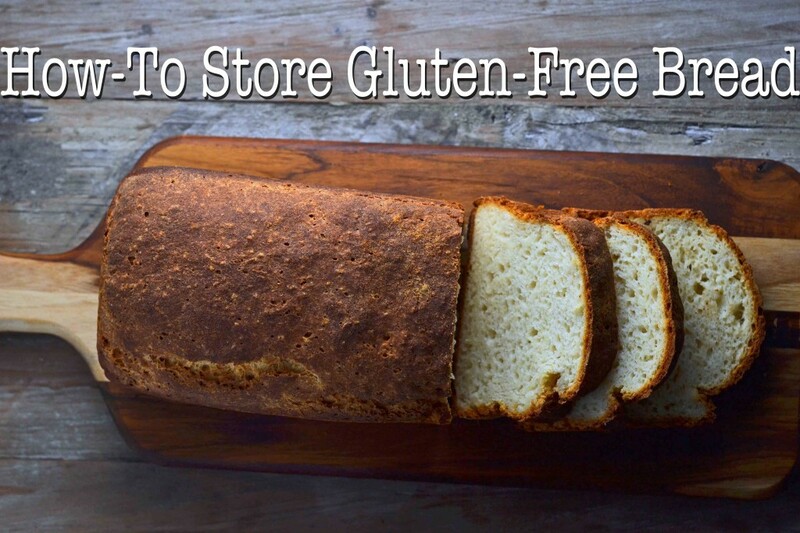 Most of these rules are for sandwich bread loaves, but apply in many instances to shaped gluten-free yeast breads. What do you mean by a bread box? ?Does it have air holes for circulation??? My husband was recently diagnosed with celiac at age 72.I enjoy your web site but the book is very difficult for me .Please consider printing the book in black ink and make life easier for us seniors.Keep up the great work!!! I have much less control over many aspects of the cookbook than you seem to imagine, Carole, including the color of the ink. I am unable to change the color or the font or anything like that. It is all decided by my publisher. An author only has control over those sort of details if she self-publishes, which I have not done. I am sorry it is difficult for you to read. I have linked to the bread box that I use in an above comment to this post. So great of you to give us pointers on how to store our bread. I know I needed it and I now I need a bread box. I’ve been keeping mine in a plastic bag in the fridge so I am all messed up and really needed the tips bad!! I make the Japanese milk bread in our abode. My little one always wants a fresh baked slice of it too when it’s still warm. I’m gonna have to tell her she’s gonna have to wait. :) I hope that she can. My question is about storing the bread cut side down, so when you store your bread cut side down, do you stand up your bread box vertically? The dimensions of the bread box said it was 6″ high. I found the Retro box on amazon for a decent price. I have a soft side for retro looms so it is perfect for our home. You can definitely find that same bread box on other sites. Just do a google search for “Polder bread box.” Another reader said she found it on amazon.com for a good price. I do not stand up my bread box. The loaf of bread would not fit vertically when it is uncut, as it would be too tall, but once I have cut off a few slices (that is, once it is cut), it usually fits vertically. Very good, thanks so much for the advise you two. Checking out Amazon right now. :) I already had to get on there are get some rice bran too. I’m preparing to teach my first gluten-free baking classes via our public school’s community education center. I would like to use some references from your blog and will credit you as the source. Is that okay? I don’t want to do anything that violates your copyright or whatever. I have your cookbook and am planning on bringing it to class, too. Is there any guidance for this type of activity? Thanks for all you do. I read the blog daily and made the chocolate covered peanut butter thins last night as an example of what gluten free baking is supposed to taste like. Once my 4 year old starts pre-k I’m ready to bake my second loaf! My first was your delicious Brown Bread recipe and my girl still talks about it though it was months ago :) These tips are fantastic because once you embark on the labor (of love) to bake bread, you definitely don’t want to waste a slice! Thanks, Nicole, for giving me the confidence to tackle what for me was definitely the most intimidating GF challenge (at least in the kitchen!). Where do you obtain a ‘bread box”? I haven’t seen those around in forever. I’ve had some success with baking bread and how it tastes the first day, but by the second day, it’s like a rock! I have a feeling these rules will help. I do have a bread box but was afraid that all that air around it would make the bread more stale. Thanks again for the tips! I would also like to know if you have a fav bread box too – also do you use a bread machine? if so, do you have a favorite brand? I linked to my bread box above. And no, I do not use a bread machine, and I am, in fact, anti-bread machine. You don’t need one! They’re also very inconsistent in their performance, from one brand to another and from one use to another. They make a misshapen loaf, some worse than others, and they are huge! It’s all based on a mistaken notion that bread-baking is a mysterious science that can’t be solved without a huge box to do it for you. Pish posh! You bet, Felonice. No need to use a bread mix. Things like bread mixes and bread machines perpetuate the myth that gluten-free bread is precious and out of reach. With the right recipe, ingredients and tools, it’s not precious at all. Enjoy. This is helpful Nik. Do you have a favorite breadbox? I need to get one. So you put it in the breadbox unwrapped, even after you have sliced a piece off? How in the world did my brain not process rule #10. You are a Saint for putting up with me. Waiting until the bread is cool makes a huge difference in the slicing. I have found that baking the bread in the evening, and covering it with a towel overnight makes it totally slick. I get up in the morning, slice it up and we are ready to go for breakfast and sandwiches. Storing isn’t really a problem, as the six of us usually knock out most of the loaf in a day! My perrsonal favorite is sourdough, my kids vote for the brown bread with teff, and my husband likes the sandwich bread because it is fastest for him to throw together. Thanks for all the options, Nicole! Just what I needed! Thank you again for your wonderful tips. It makes learning this Gluten Free thing so much easier. I have your book and it has CHANGED the way I do things around here – LOVE LOVE LOVE it! And those are such great tips – GF bread is really its own animal so these are super helpful for people new to the GF life. Thanks so much for this and everything you do for us! Since I am the only person eating GF bread and I don’t eat it daily, I cut off a chunk to last about 3 days and slice and freeze the rest after cooling. No reason to wait until it is 3 days old. You are right about bread being the holy grail of baking. The last loaf I made with various whole grain flours I felt should have sold for at least $12.99 with all the labor. It was good though and lasted a long time in the freezer.